The group continued walking together over the next two days. We were the fellowship of the mountain Annapurna. The days and the moments within them were full of general cheer and mirth. Each of us had our own characteristics. And we managed to hold on to them and to the group overall. We weren’t breaking up. Not just yet. The walk to beautiful Chomrung was long and circuitous on day one, but when we did get there late afternoon we kinda forgot all of it. The small mountain settlement was full of character, replete with tiny shacks serving delectable comfort food in wide variety. Pizzas. Burgers. Stuffed croissants. Apple pies. The whiff of freshly baked food activated the gastric juices within. Internet access was very welcome and so were the chilled beers. A hot shower followed by the wide variety of things to eat was too difficult to ignore. So all of us rushed into it head-on, taking turns with our change of clothes and shower gels on hand. The place we stayed at also served scrumptious wood fired thin crust pizzas. Heaven. It seemed to me. Dinner would surely be memorable. The famed Chomrung Cottage bathed in morning sunlight. With Annapurna South towering over it. Lonely Planet recommended as well. Famous for its wood fired pizzas. 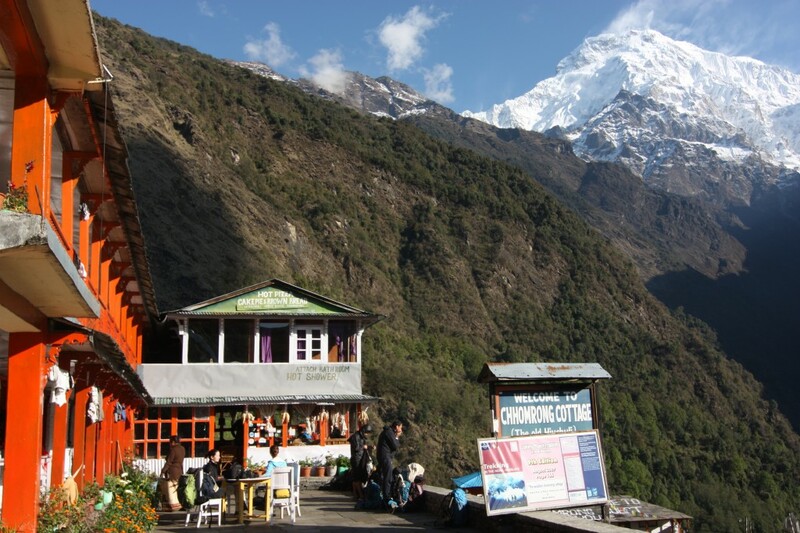 Chomrung, nestled right on top of a mountain range was the gateway to Base Camp Annapurna. It reminded me a lot of Tyangboche Monastery enroute to Everest. The same panoramic spread lay in front. While the view from Tyangboche was an enormous spectacle with Everest and Lhotse rising gigantically in the horizon, the view from Chomrung was different in a sense. We couldn’t see Annapurna, though we did try to make out some sense of the trail we had to follow through what seemed like dense alpine forests which lay below us. There was Annapurna South to our left and the fish tailed mountain Macchapuchhare to our right. Often known as the most beautiful peak, Macchapuchhare was striking in its natural formation with its twin peaks resembling the tail fin of a fish. 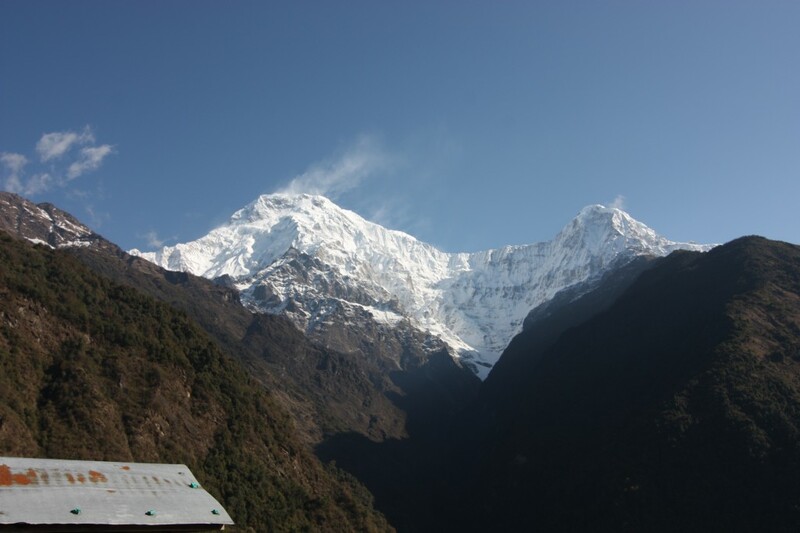 Our first target was to reach its base camp and then from that another 2 hour journey through massive snowfields and valleys would lead us to Annapurna Base Camp. The horizon was overcast, grey and gloomy as I stood alone, silently gazing towards the mountains ahead, lost in thought. The crisp visibility of the horizon, the faces of the mountains would be there to see the next morning as was the norm in the Himalayas. It had been a long journey for me. An exciting outdoor adventure thus far. Pretty much like what the hobbit, Bilbo Baggins had been through and had captured in his memoirs There and Back Again. Dinner that evening was a mix of pizzas, dal bhaat and greens for the group. Together with conversations on the road ahead with fellow travellers who had just returned from the Base Camp. And with those who had scheduled an early morning departure with the intention of reaching Annapurna Base Camp in a single burst of focused walking. We had a different schedule, with a stop over at Macchapuchhare Base Camp instead. Our guides thought that would be better as the night at the ABC lodge would be very cold and perhaps getting to ABC would also be an extended push for all of us. So next morning we began our long journey to the Himalayan Hotel, where after spending a night, we would carry on towards Macchapuchhare Base Camp. 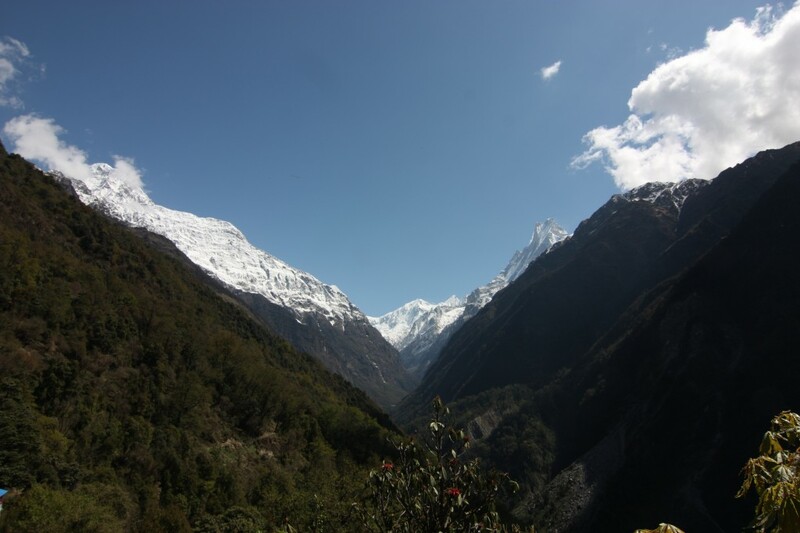 The ABC trail continued in its distinct character which was so different from the Annapurna Circuit trail. Sub-tropical dense jungles, sounds from all kinds of insects, slushy mud paths, numerous waterfalls and the countless man-made steps kept us company. Together with this, the humidity hung low in the air and the sticky warmth got stifling at times. 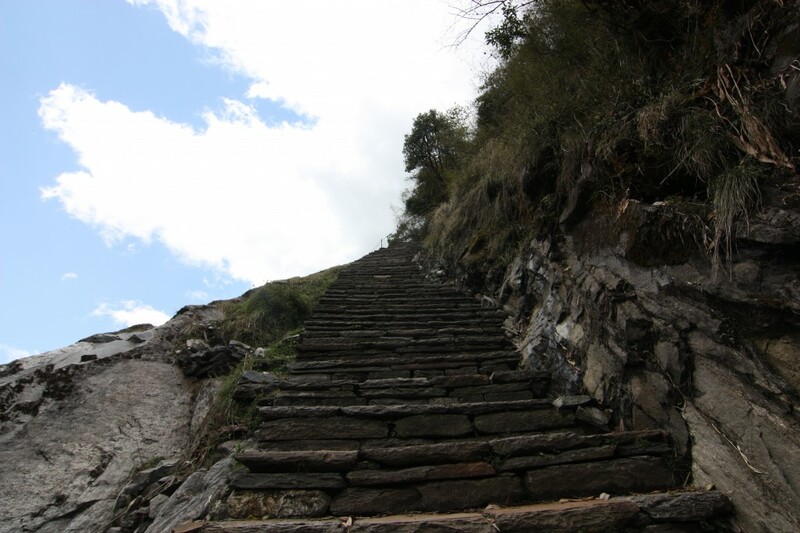 The man-made steps were also the most irritating and hard on the knees while descending. Why had they been fashioned this way we wondered? The walk in the initial hour, was also often interrupted by the buzzing drone of those low flying helicopter sorties. Back and forth from ABC to Pokhara to ABC. As we realised much later. At those moments however we hadn’t a clue where these choppers were flying to in both directions. I knew though, they were flying towards and from the direction of ABC. Were these rescue missions? What had happened? Three and half hours later, I noticed the standard green foliage around us had made way for bamboo plants. Hundreds of them surrounded us on both sides. And then somewhere through them I caught a glimpse of the lodge. The name of the place? Why, Bamboo ofcourse! It reminded me of the recently released Bollywood film, Bamboo! How simple it was to name a place in the mountains. Varun, Sweta, Ramnik and I had reached the midpoint for the day. We had to wait for the rest to show up. Soon half an hour became an hour and we kept waiting. Kalpak and Ketan soon joined us. Where were Binod and Rushabh we asked? Binod had run into trouble. His knees were giving way and hence he had slowed down, considerably. Aided by the group’s guide Mahesh, he was struggling to keep up. Rushabh was keeping him company and encouraging him to continue. I knew this news wasn’t good and the group would have its first casualty and drop out. I rued the fact it had to be Binod. Amongst everyone he was the one who was the most enthusiastic on reaching ABC. He was also the glue within the group. His earthy humour and jokes cracked us up often. It would be terrible to lose him in this unexpected fashion. Eventually he did show up though by now we were ready to move on. Lunch was done with and the shivers had started creeping through, as the body kept cooling down rapidly. Binod looked like he’d been hit by a raging storm. He walked in, gingerly towards the lunch table we had all assembled around. He had made up his mind to stay back at Bamboo instead of continuing the journey. This was a very wise decision. And the fact that he had decided it, instead of it being forced upon him was commendable. There would be too many uncertainties to face in the coming days and there was also the return we had to keep in mind. Binod had to stay back. There wasn’t any other choice. We bade him farewell, wishing him the best and carried on. 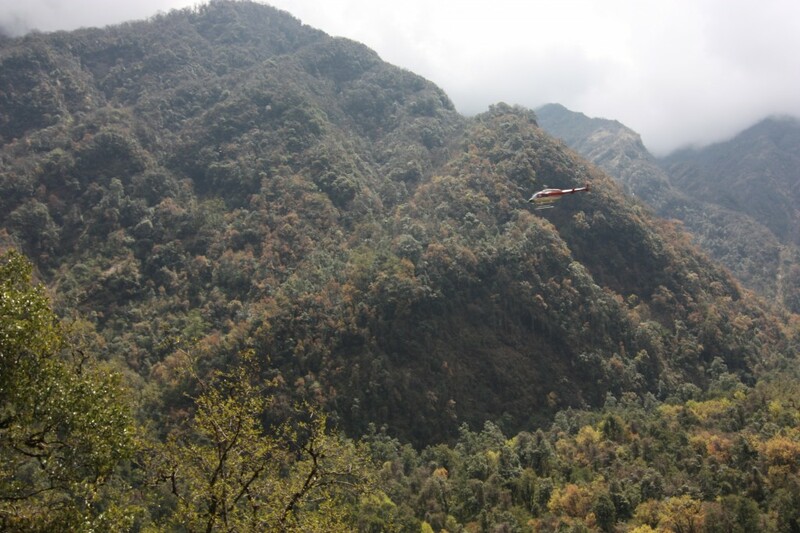 He planned on staying the night over at Bamboo with one Sherpa support staff from the group to assist him and continue to descend the next day to Chomrung and then onwards to Pokhara over the following day. It would be a long journey for him at his speed. We were now down to 7 in the group. By the time we reached the hotel Himalayan, it was 4pm and drizzling heavy. The poncho helped keep the water away, somewhat. But the conditions overall were extremely wet. And some body parts did get drenched. Getting into the safety of the lodge room to escape the torrential rain was a godsend. However it also meant the upper reaches would be receiving very heavy snowfall and visibility in all likelihood would be near zero. I only hoped this didn’t continue the next day as Base Camp Macchapuchhare would be cold and blanketed in a sheet of white. It would also hamper our surge to ABC. With not much to do except enjoy multiple rounds of hot lemon and popcorn, we bided our time and waited for dinner to be served so we could retire. The next day would be interesting to navigate since we were getting closer to the peaks. That night Rushabh couldn’t sleep and complained the onset of a slight headache and a racy pulse. He had, had Diamox earlier which apparently hadn’t helped. He wanted to check his blood pressure but this wasn’t possible. We advised him rest and sleep; that he would be better the next morning. It was probably the altitude which was affecting him and the body would take time to get used to it and reach an equilibrium. I had been through this in the Stok Kangri summit attempt in 2003 in Ladakh India. I wasn’t worried. Anyhow, somewhere, sometime we had all dozed off. The next morning when we awoke and had finished breakfast, Rushabh announced his decision to head back. He was fine now but wanted to return. 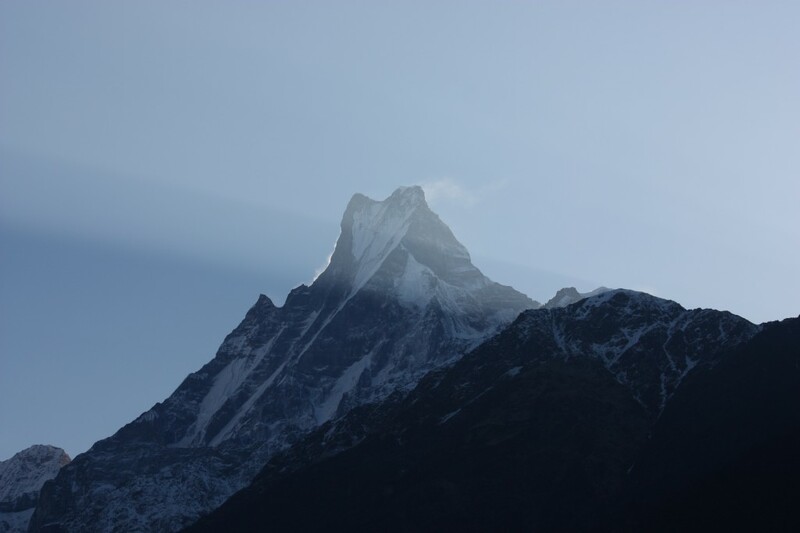 He would join Binod at Bamboo and then both would descend to Chomrung and Pokhara together. I was surprised at his decision. He could walk slow, make it to Base Camp Macchapuchhare and then evaluate the situation accordingly. After all the group’s objective was to reach ABC together. But it seemed no amount of encouragement could sway him. When the mind gets burdened by anything awry, things do get out of proportion. The toil of the days gone by, the exhaustion, the thought of retracing the long journey back, the comfort of the hotel room in the city (Pokhara) add to and colour decisions taken. In Rushab’s case, I sensed it was a mix of everything in varying degrees. Plus his hunting mate Binod wasn’t there too. As I looked at him, I realised these were things unspoken. I could have been wrong in my assumptions, however. We shook hands, hugged and went on ahead. The fellowship had lost another of its members. We had now been reduced to 6.